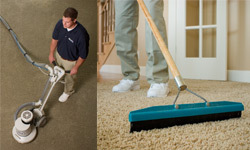 Our Simply Magic technician will walk through your home with you to visually inspect the carpet. He will identify potential permanent stains and give you an evaluation of expected results. In addition, your technician will measure all areas to be cleaned and provide you with an accurate invoice prior to starting the cleaning process. Our regular pricing includes moving sofas, chairs, tables and smaller items. Beds, dressers, and heavier pieces are left in place under our regular pricing structure. One of our consultants can quote the exact cost any heavier pieces. Any furniture not moved is subtracted from the square foot price. Difficult spots are pre-treated with special solutions to increase chances of removal. Specialty stain removal -coffee, food dyes, inks – is often an added cost. 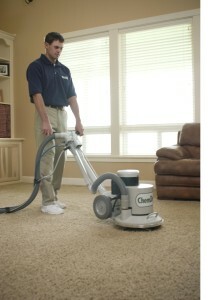 A professional carpet groomer is used to further loosen the soil if necessary. 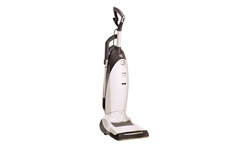 The carpet is then thoroughly cleaned with a powerful rotary extraction cleaning system with a tool called the Powerhead®. 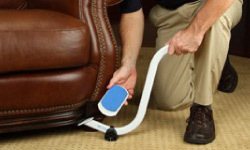 The Powerhead® allows maximum soil removal without over wetting the carpet or leaving a sticky residue behind. 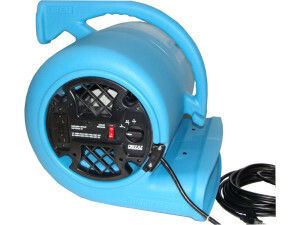 High velocity air movers are placed on the carpet immediately after cleaning to promote faster drying when needed.